As a follow up to The Magnificent 7 from last year, I’ve found seven more unique, unusual, quirky – pick your adjective – places to stay for adventurous travelers, from the cold of the Arctic Circle to the heat of the African bush. This time around there are glass igloos, sewer pipes, rock salt structures, and caves, caves and more caves for those travelers seeking experiences that are one-of-a-kind or off-the-beaten path. Bon voyage! Adrère Amellal Eco Lodge is an oasis in the desert. Really it is. Located at the foot of the White Mountain in Siwa Oasis, Egypt, it’s one of the world’s last remaining oases. 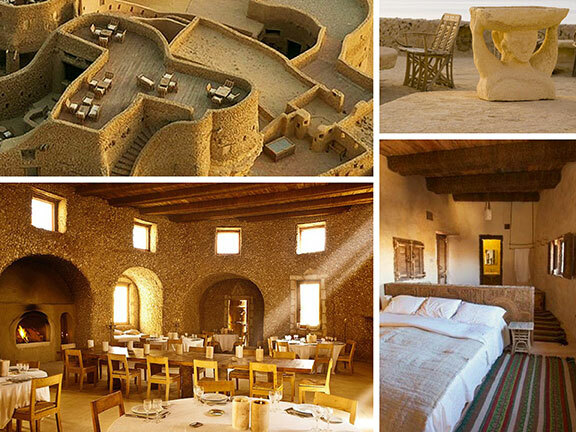 Siwa boasts ancient historical ruins and cultural traditions dating back thousands of years. The lodge is a unique place, and a timeless escape into ancient Egypt in a region of exceptional geological features, diverse flora and fauna, and natural freshwater springs. Its mud and salt-brick edifice is built into the side of the mountains and blends naturally into the landscape. With 40 unique, hand-built rooms (no electricity), the decor salutes local artisans and includes Bedouin Carpets, palm-wood doors and palm-frond beds. High up at the Arctic Circle, in the northeast corner of Lapland, the Kakslauttenen Artic Resort offers an experience of the Northern Lights in a whole new way. Stay in a glass igloo: Built with special thermal glass to avoid fogging and maintaining a normal inside temperature, the igloo sleeps two in a luxurious bed and has a toilet and basin. Stay in a snow igloo: With inside temps in the mid- and low-20s (outside temps are in the -20s), the igloos include a down sleeping bag, wool socks and hoodie, and a promise from the management that you’ll never feel cold. 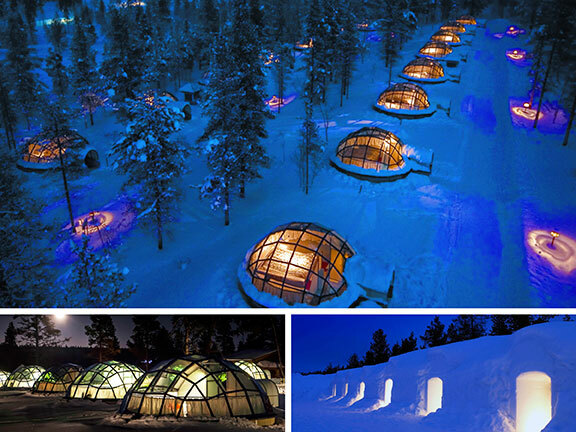 Enjoy the quiet of the snow igloo with up to five people. You can also stay in the nearby log cabins, and go from sauna to ice-hole, all under the expansive northern sky. Way down in southern Italy, situated between its boot and its toe, sits a lesser-known province called Basilicata. 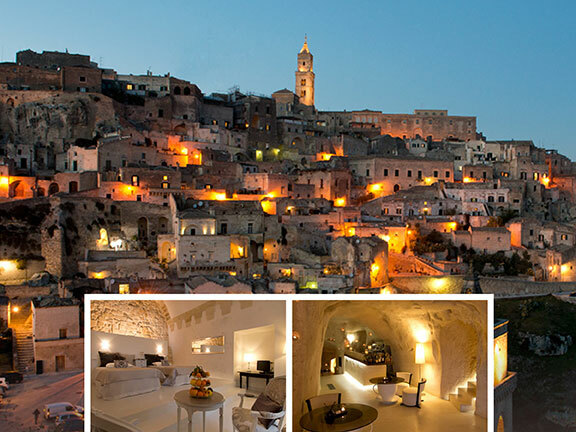 There, nestled among the mountains, rests a “Four-star boutique cave-hotel.” The Sant’Angelo Luxury Resort is located in the historic city of Matera, famous for its Sassi – houses that are dug into rock. The hotel exists because of the fine preservation of more than 14,000 square feet of rock that includes cave dwellings, pathways, stairways and courtyards. The recently renovated property features 21 unique, historic dwellings – each with an interior design that perfectly blends the original structure with modern furnishings. The resort also includes a restaurant serving local cuisine, relaxing panoramic terraces and an art gallery. 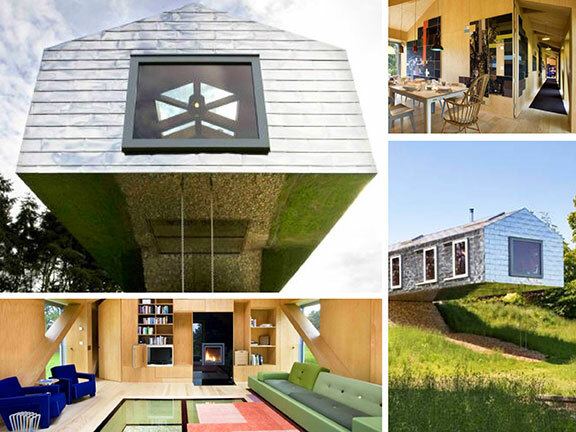 The Balancing Barn is one of five dramatic and imaginative houses in the UK built by Living Architecture, a nonprofit founded by the writer Alain de Botton (The Art of Travel). The organization specializes in harmonizing the relationship between environment, architecture and happiness. Half of the building is firmly attached to land while the other half dangles precariously off a slope. How did they do it? A central concrete core, perhaps. Perched on the edge of a nature reserve, the award-winning modern barn in Suffolk sleeps eight people. It features silver tiles and large windows with panoramic views of woods and meadows, and there’s a swing under the overhang. A perfect long-weekend getaway with family and friends. Mkhaya is one of my favorite places on earth. Located in southeast Swaziland in the heart of the lowveld: It’s a haven to endangered species that roam free in the African bush of this premiere game reserve. I’ve been lucky enough to stay here twice. Open land rovers and walking safaris (the best!) allow visitors to get fairly up close and personal (with an experienced guide) with four of the Big 5 including black rhino, and white rhino, elephants, giraffes, crocodiles and a whole lot of bird life. Back at Stone Camp, there’s delicious bush cuisine waiting. At sunset, Stone Camp is beautifully lit by candles and lanterns that outline the path to your glorious semi-open stone and thatch cottage. Drift off to sleep to the sounds of the bush at night. 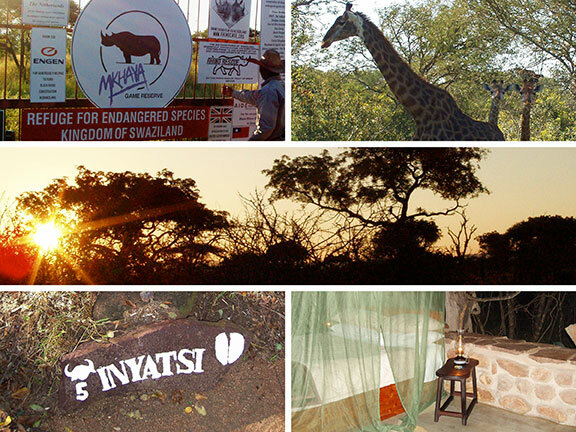 Mkhaya is staffed entirely by Swazis from local communities, and enforces one of Africa’s most effective anti-poaching programs. At Kokopelli’s, enjoy unparalleled views of beautiful southwest sunsets, and the states of Arizona, New Mexico, Utah and Colorado. 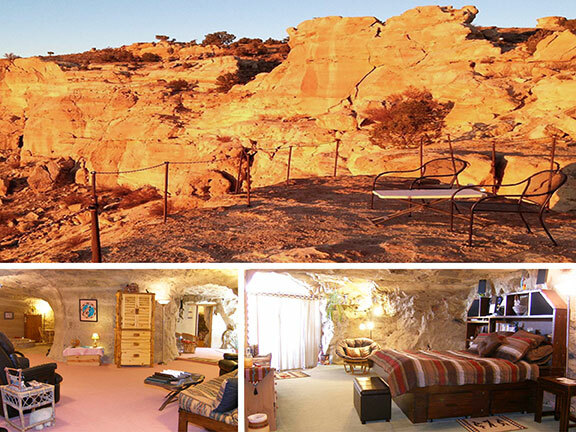 The house is built into the vertical cliffs of Tertiary Ojo Alamo sandstone, 70’ below the surface, and overlooks the La Plata river valley. Enter by walking down a sloping path and steps that cut into the sandstone along the pathway. There is no elevator – think backpack – if it doesn’t fit, it doesn’t go. The Cave consists of a master bedroom, living area, replica Native American kiva, dining area, full kitchen and bathroom with rock walls – approximately 1,700 square feet, and the temperature stays comfortable, 68° ~ 73° year around. 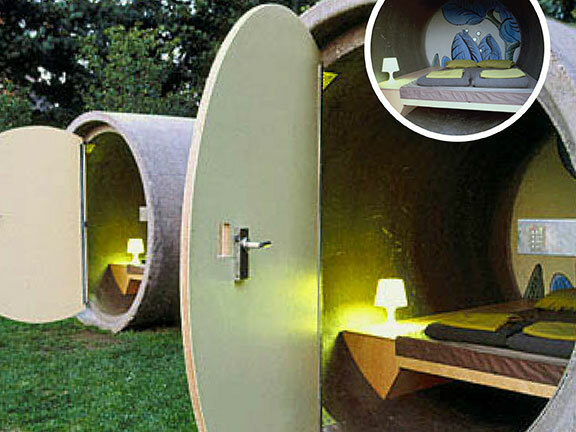 Pipe dream realized – at Das Park Hotel, you can stay overnight in a concrete sewer pipe on the banks of the River Danube. It’s hospitality for public spaces, and it’s up to you how much it costs. Collected fees go toward cleaning and repairing the accommodations. Open from the spring through autumn, this no-frills accommodation allows travelers a safe place to hang their hats for a night or two, while using the surrounding infrastructure for their bath, restaurants and entertainment. The drainpipes are two meters in diameter and two and a half meters long (approx 6.5′ x 8’), are wired for electricity and have a porthole. Entering through the front door, the bare-bones dressings include, a futon, a bedside lamp and a blanket. Outside your door, there’s the blue, blue Danube. Which place do you have your eye on? This entry was posted Thursday, May 8th, 2014 at 7:27 am	and is filed under art, just curious, travel. You can leave a response, or trackback from your own site. This was an awesome article, thanks for the information! I enjoyed every little bit of the post and have favorited your blog.